Boys play soccer for fun, but some teams play in tournaments at local and higher levels. Beach volleyball draws kids off the streets to wholesome play. 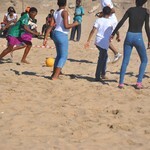 Surfing was the first sport uMthombo made available for boys and girls on the streets of Durban. Now a variety of sports is offered. uMthombo's Director, Mpendulo Nyembe joined cyclists from all over the world to raise funds through Amos Trust by cycling from London to the Eiffel Tower in Paris in 4 days. uMthombo Street Children is a South African Non-Profit organisation committed to leading street-connected children and youth out of street life towards alternatives, through sports and other carefully constructed activities. In many cases, this means reintegration back into their communities with appropriate family preparation and support. Where families are too fragmented or dysfunctional, uMthombo prepares youth for living productive independent lives. There are no quick fixes due to multiple trauma, but street-connected children and youth can and do transform their lives. uMthombo follows a carefully constructed multi-pronged strategy that has had long-term impacts on many young people's lives. My Europe trip came at the right time, since we as uMthombo have been needing to strengthen our relationship with existing supporters and to build new avenues of support with other supporters. Many thanks to Amos Trust and Friends of uMthombo for making it all possible – and of course, for their wonderful hospitality and friendship! This was a phenomenal experience, setting one’s goals, working towards them, facing challenges and finally getting there can be seen as a metaphor for our work. FUN was the order of the day at the Hero’s Welcome beach event held in honour of the director of uMthombo Street Children SA, Mpendulo Nyembe, who undertook a 400km cycle from London to Paris to raise funds for local street children and youth. On the day of the event, a multi-sports festival was held on the beach at which street-connected children, the youth and public took part in various sports which was followed by a prize giving and celebration of life. The publicity generated by this event resulted in the organisation receiving over 42 calls from young street-connected individuals and families seeking help. and work towards achieving alternatives to street life. Outreach through sports and psycho-social support, helping street-connected children and youth to heal from trauma, rebuild confidence and hope, and to develop self-discipline and set positive life goals. Assessment of family situations and where possible prepare for reintegration; crisis family support and/or referral to specialist support as needed. Reintegration - Return or new placement into direct or extended family were appropriate and safe, or preparation for independent living. Aftercare – monitoring and support of child/youth and family after reintegration. Community Development and Prevention in townships surrounding Durban. Joint advocacy for improved laws and policies that challenge stigmatisation of street-connected children and youth, and call on relevant authorities to put in place measures to address their needs and support other stakeholders who do.